Aromas swirl from raw honey to white clover blossoms to fresh lake breeze. The palate is a striking contrast to the nose with juicy kumquat, toasted hazelnuts and chamomile. The sweet floral, tart citrus and bitter citrus peel elements have seamless integration in a balanced structure. Bright acid and silty tannin are equal in the finish which is long and lingering with more honey, citrus and a bit of candied peel. 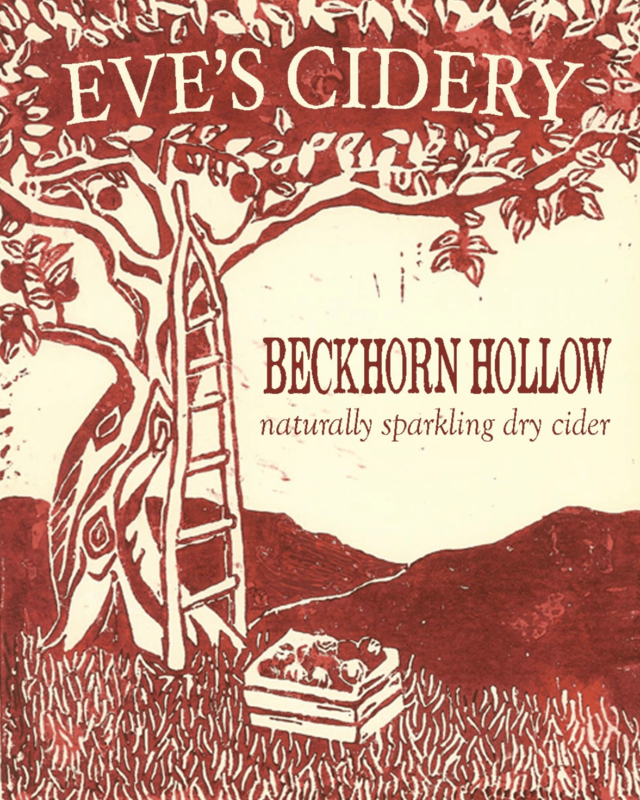 The technical data on the 2014 Beckhorn Hollow stands out: the highest alcohol of our ciders (8.9%) and the highest acidity (9.7 grams/liter). But, as is the case with all of our blended ciders, the numbers were not the goal. Blending starts with the belief that individual varieties can achieve a synergy together and the whole can be better than most single variety ciders. When we sat down to blend the 2014 Beckhorn Hollow our goal was to make a crisp, mouth watering aperitif with an heirloom quality to the aromatics. “Structurally, the Beckhorn Hollow is a near equal parts of tannin, acid and sparkle. It is dry…100% dry… Please take note of the acid and tannin balance when you taste this. It is testament to the hand of master apple blenders.” (bold removed) Tom Wark, Cider Journal, 9/30/15. The majority of the blend is made from apple varieties bred or discovered in the United States: Northern Spy and Golden Russet (New York State), Idared (Idaho) and Wickson (California). This cider is an example of the potential of American apple varieties.